Every ski mountaineer dreams of completing the “Haute-Route” linking Chamonix with Zermatt. English climbers were the first to imagine joining these two capitals of mountaineering by crossing the high altitude passes. After much exploration it was in the summer of 1861 that the “high-level road” was walked for the first time. Skis arrived in France in the late 19th century. In Chamonix Dr Michel Payot was using them to visit patients during the winter months. The opening of the rail line with le Fayet brought winter tourism to the valley for the first time and people began to climb and descend the slopes on skis. In January 2003 Payot judged that conditions were right for a ski crossing to Zermatt following the summer walking route. He was joined on the adventure by local mountain guides Joseph Couttet, Alfred Simond and Joseph “the red” Ravanel. It should be remembered that guides only worked during the summer and had other occupations during the winter. 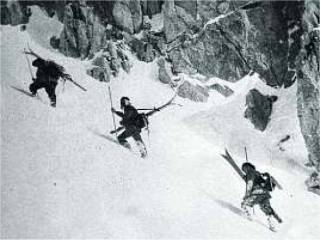 Their rucksacks weighed 10 kg, they had 2 meter long wooden skis, climbing skins and a single 1m80 beech pole. On the 16th of January they set-out from Argentière to the chalets at Lognan. From there the group climbed the Argentière glacier then roped up for the Chardonnet judging the snow bridges over the glacier to be “suspect”. They were proved right when the snow gave way beneath Simond on the climb. The col du Chardonnet was followed by the 3309m col de Saleinaz where they pic-nicked on roast beef and partly frozen red wine. They transformed their skis into sledges for the descent through the narrow and steep Echelettes gorge. At Orsières they were met by a car which took them onwards to Châble. On the 18th the weather closed in and it was only at the fall of night that they reached the Chanrion hut. They started out at 3am for the long climb of the Ottoma glacier. At dawn they saw the Petit Collon but the weather worsened and they decided to make a U-turn pass the night once again in the Chanrion. They were short of food and worse, there was no wine! On the 20th the weather was bitterly cold. No hope of completing the long stage to Zermatt in those conditions. They skied down to Martigny and dined on raclette. The comfort gave them renewed courage and they restarted their voyage on the 22nd at 3.30am. The track was well trodden to Haudères and they dragged their skis behind them on a cord. At 5am they left the path at Pratz-Fleuri and set out into vast snow fields. They climbed below the splendid Dent Blanche and the glacier de Ferpècle reaching the 3480m col d’Hérens some hours later. The view across the horizon was breathtaking with the Monta Rosa in the distance and the Matterhorn rising abruptly in front of their eyes. On the other side, the glacier Zmutt and a steep ridgeline. They climbed down the steep slope from the col to the Zmutt with skis on their shoulders. It was night by the time they reached the glacier. Ravanel lit his latern. The glacier, which by day would have taken them little more than half an hour to cross was a major problem at night. Only the thought of a warm bed and hot supper kept them going. It was nearly midnight when they reached Zermatt. The luxury hotels were closed and there wasn’t even a guest house. They knocked on doors but the only person to answer shouted that they were a bunch of drunks. Finally they found the town priest who indicated the way to an open hotel. Dr Payot reflected about what they had learned on their adventure. “Many say nothing, except tiredness, worries and suffering of all sorts. Common opinion doesn’t matter to us. We retain our desire to continue these wonderful winter adventures. We understand the value of skis as a means of travel. We can climb as fast as a summer walker, and what would be a tiring descent is turned into pure pleasure.” Thoughts that a modern ski or snowboard tourer can readily indentify with. Over the years other variations were explored. In 1908 Marcel Kurz, Professor Roget and the guides Maurice Crettex and Louis Theytaz crossed from the Valsorey hut to Chanrion via the col de Sonadon (3489 m) then from Chanrion to Bertol by the col de l’Evêque making the first winter ascent of the Dent Blanche. The modern Haute-Route was born. With five to six days of skiing, using huts for overnight stops, the route covers 5000 vertical meters and is undertaken by thousands of skiers from around the world each winter and spring. Docteur Payot, Revue Alpine (Lyon Section of the CAF), September 1903, pp.269–284. ...In January 2003 Payot judged that conditions were right for a ski crossing to Zermatt following the summer walking route. Good on him, he must have been over 140 years old! he certainly wouldn’t last 5 nights with Carole Dechantre! Must be all that red wine, strong cigarettes and cheese.....? i’m going to live a long time then! Good question, she’s a French TV actress who has branched out and decided to make a series of DVDs showing that “average people” can do things like climb Mont-Blanc or ski the Haute-Route. She seems to be a fairly competent skier though given the heavy sack.